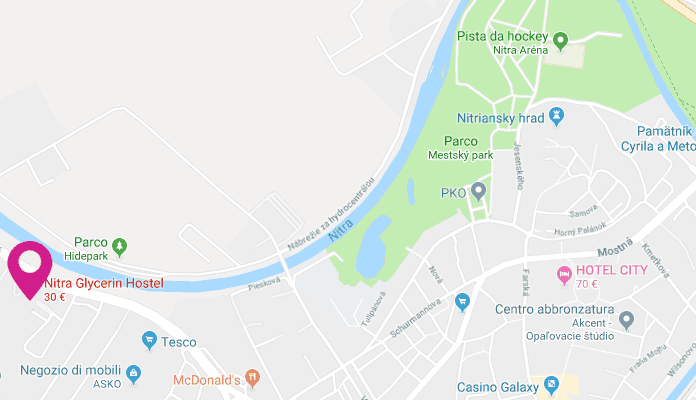 When you land at the airport of Bratislava, just outside in front of the arrivals exit you'll find a shuttle bus that will take you directly to the bus station of Nitra. (You can buy the ticket directly from the bus driver). In case you are looking for the bus schedule please ask at the information point inside the airport. Once you arrive at Nitra’s bus station, either get a taxi right in front of the station or call any of the following taxi services. The average price is €2.50 to €3.00. From Bratislava, take the first exit Nitra-zapad that will put you on the road No. 51 and then the second exit, Nitra. You will pass a Renault garage, and 500 m after a petrol station OMV: this is the entrance to the street of the hostel. So be prepared to make a right turn just before the OMV gas station keeping it on the left then follow our signs to reach us. If you can't find the hostel, call us at the +421 902 695505 and we will arrive in 2 minutes to pick you up at the OMV.